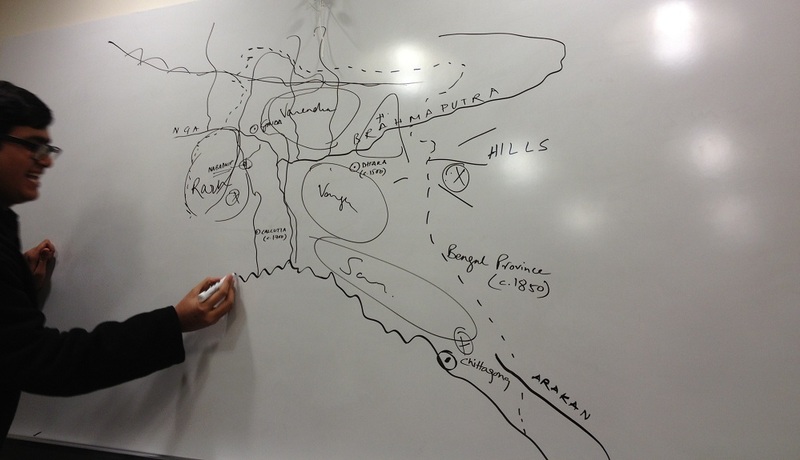 One of my classmates had shown up early to draw a map of Bengal on the board. There’s a song from Spring Awakening that seems relevant here. Let’s just say, there’s a moment you know… you’re outclassed. This was that moment for me, or at least, it felt that way. I took the class at the invitation of that very classmate. I had already exhausted all of the classes on Hinduism at Tufts, and so decided an independent study on modern Bengal was a great way to continue my exploration. I found myself, however, in class with a sophomore who is actually from Bengal (and is better read than some professors on the subject), a student in the master’s program of history at Tufts, who focuses on Bengal and casually already has a master’s degree in religious studies from Harvard Divinity School, and a first-year PhD student at Harvard, also focusing on Bengal. I am one of very few people majoring in religion and focusing on Hinduism at Tufts, so I’m used to generally having more background knowledge than the people I’m taking class with. But I soon found myself having to take a step back in this class, as everyone else in the room had a far deeper background in Bengal studies than I did. This is actually an analogous situation to the hardest part about transitioning to Tufts for me. I came from a high school where I was generally the only one in class who actually cared about what we were learning. Most of my peers were more interested in the grade than in actually exploring what we were learning for the sake of knowledge itself. But at Tufts, most of my friends were also those people in high school. So I found myself surrounded by students who cared, and by students who had more knowledge and experience than me. For the first time ever, I found myself sometimes shrinking back from contributing in class, because I wasn’t sure I knew what I was talking about. I struggled with other classes because I never learned to take notes from what my peers said, since I’d never been taught to learn from my peers. And some of what they said was on the tests. By my second semester, I’d recognized that being open to learning from my peers is just as important to academic success as being open to learning from my professors. I now take notes on what my classmates say, and consider their ideas just as thoughtfully as those presented by the professor. So I’ve taken a similar strategy with my current class. I’ve stepped back and spent more time listening. I’ve done some extra background reading, and spent extra time checking footnotes and looking up references to other scholars in the books we’ve read. Now I feel much more comfortable speaking up, not only because I have a better base of knowledge, but also because, even though I’ve felt outclassed, I’ve also learned that open discussion with peers who sometimes outclass me is the best way to challenge myself and push my learning even deeper.